Experience the thrill of opening your own geode and being the first person to glimpse the crystal treasures inside. 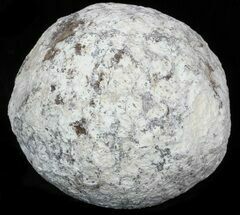 We sell whole, unbroken/uncracked geodes of several types allowing you to do just that. You never know what will be inside. You can either crack them using a hammer or we can pre-crack them with a specialized geode cracking device that will create a clean break with a much lower chance of damage. Just let us know in the order instructions whether you want us to pre-crack them or not. How to break your own geode? It's recommended that you ask us to pre-crack your geode using a specialized geode cracker which is much less likely to cause damage to the crystals inside. We'll rubber band the two halves so you can still be the first to look inside. If you want to crack them yourself, the best method is to use a hammer and chisel. First, score the geode all the way around the circumference of the geode with the chisel. It's suggested that you use a flat-faced chisel and not the pointed type, because the force from a pointed chisel will be directed over one spot versus over a larger area. 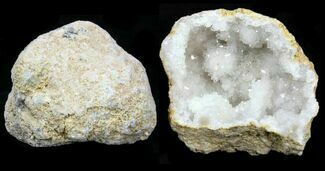 Continue this process until you see a crack develop in the geode, and then follow the crack around the geode until it opens. Begin lightly at first and then strike harder if a crack is not developing. You can also place smaller geodes inside of a sock and hitting them with a hammer. This protects the person breaking them and bystanders from any flying debris. This is a recommended method if smaller children are around. Here is a video clip of us cracking a large Keokuk Geode with the geode cracker.